To ensure that we prepare today’s young people to meet these demands, we need a clearer vision of a career-ready high school graduate and new, more deliberate approaches to making that vision a reality. Project-based learning, an innovative instructional approach which has shown promise in improving both student engagement and academic learning, also has potential to help drive career readiness. Students at STEM School Chattanooga in the school’s FabLab, which provides students with the resources to fully design, prototype, and test products for their projects. While many of these competencies are often referred to as “soft skills,” the evidence suggests they may be much more important and harder to develop than previously assumed. As described in our previous paper, Getting Real About Career Readiness: A Focus on Cross-Sector Competencies, ensuring career-ready graduates requires schools to be much more deliberate about both defining the profile of such a graduate, including these in-demand, cross-sector competencies, and developing and implementing meaningful, aligned strategies to support them. 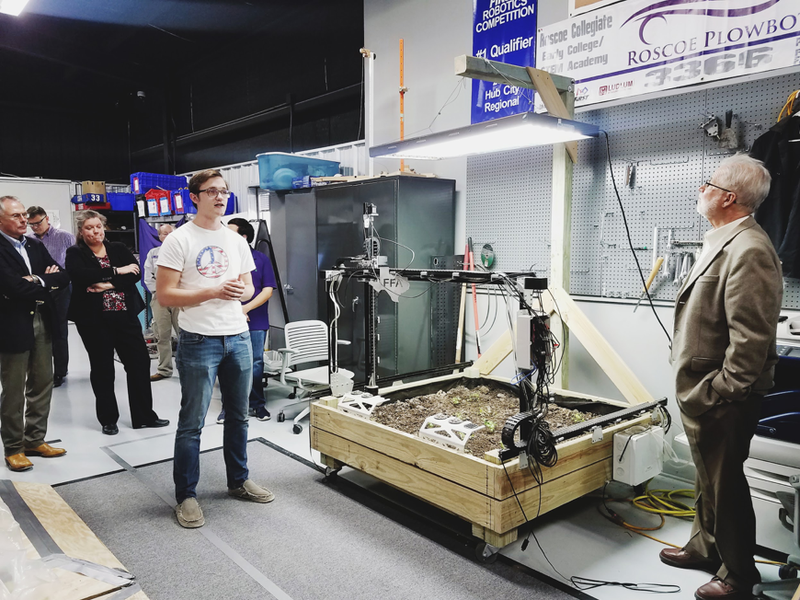 A student at Roscoe Collegiate High School demonstrates his watering system project for a group of visitors. Studies of PBL show positive effects on both student engagement and academic learning, and suggest potential for improving a range of career readiness skills. While the research on PBL’s impact on the development of cross-sector competencies is incomplete, a review by MDRC, a nonpartisan education and social policy research organization, argued that “the new focus on higher-level thinking skills” and, what it termed “socioemotional competencies” seems “well aligned with the goals of PBL.” MDRC concluded that while PBL is not yet proven in this space, it is promising. Through careful review of existing research and resources, insights from convenings, and our ongoing work with innovative schools and educators, America Achieves Educator Networks concludes that project-based learning, if planned deliberately, can be an important lever in developing a range of career readiness skills. Our key findings and recommendations for related school and district planning are included below. At Freiherr-vom-Stein-Schule Neumünster in Germany, students collaborate on a project involving smartphones. Over the last few years, we have seen significant growth in the interest and pursuit of PBL as a teaching and learning strategy. One need only look at the number of books, conferences, professional development providers, blogs, and school websites to see the trend across grade levels, school types, and even national boundaries and local contexts. The variety of resources and actors also speaks to the many goals, definitions, and approaches to PBL. Perhaps one of the greatest potential benefits of project-based learning is the role it can play in helping students become career-ready by taking a deeper interest in their studies, experiencing improved learning outcomes, and developing the cross-sector competencies critical to career and life success. However, we cannot take this potential for granted. At Gwinnett School of Mathematics, Science, and Technology in Georgia, students have the opportunity to take music engineering classes as part of the school’s STEM-focused curriculum and industry-aligned programming. Says Principal IV Bray, “We don't prepare kids for college - we prepare them for graduate school and CEO positions.” As part of the school’s vision, all seniors have a year-long capstone project where they gain hands-on, real-world experience. In effective PBL, the learning goals and the process for achieving them are central to the design. The potential of PBL to support students’ mastery of core content and cross-sector competencies is conditioned on the intentionality with which PBL is planned and executed. This process begins with building a vision of what PBL is and why it is important to a particular school or group, articulating a community-wide vision of a career-ready graduate and how PBL can support this, and defining related learning goals—from standards and competencies to essential or driving questions to problem design and aligned assessment criteria and rubrics. These areas are made explicit in America Achieves’ draft PBL design and reflection rubric, an adaptation of BIE’s Gold Standard. Likewise, we have added explicit attention to task clarity and accessibility to reinforce our vision and priorities for career readiness-focused, high-quality PBL. As schools and districts develop their own vision and priorities, it will be important for them to document and reinforce these in common tools and processes (e.g., PBL criteria, planning templates, communications with partners). A student at Roscoe Collegiate works in the school’s welding lab. Through project-based learning, students at Roscoe have the opportunity to gain the skills desired by local and state industries, including welding, veterinary sciences, agriculture, and drone piloting. “The development of a coherent curriculum is one of the most important but difficult aspects of designing a project-based approach,” based on MDRC’s review of a number of project-based learning studies. [x] A quality, coherent curriculum not only considers the placement of standards within units but the strategic relationships and interconnected nature of topics, concepts, standards, and skills. In the book Understanding by Design to Creating High-Quality Units, Wiggins and McTighe describe three stages of planning that include: 1) identify desired results, 2) determine acceptable evidence, and 3) plan experiences and instruction accordingly. Unfortunately, being clear about desired results, the first stage, is often the most difficult and most taken for granted. Such clarity matters in the context of PBL, where longer-term, interdisciplinary planning must take precedence over individual project or activity planning and where learning goals are both less discrete and more ambitious, especially our expectations for skills development and knowledge transfer and application across new contexts and ever more challenging problems. Notably, it is important for schools to identify and then plan, teach, and assess the cross-sector competencies included in their visions for success. It cannot be assumed that acquisition of these skills will happen automatically as a result of project-based learning; planning and ongoing evaluation are critical. Effectively designed and implemented PBL generally requires students to practice a variety of cross-sector competencies important for career readiness in the solving of real-world problems. If we are truly looking to leverage PBL in support of career readiness, there are multiple considerations. We might ask ourselves not only is the problem authentic to the real world in the 21st century, but are we also introducing students to and building their capacity to appropriately choose among and meaningfully apply the equipment, standards, and processes of specific industry sectors. Spencer Kiper, an America Achieves Fellow and the 2019 Louisiana Teacher of the Year, argues, “PBL has to go beyond the school to be authentic - it has to have a component that engages community and industry.” Kiper’s students host a STEM movie night for their local community. “We bring students to a collaborative space where we lead them through a shared experience - the viewing of a movie - then have industry come in and connect academic concepts introduced in the movie to the actual industry." A commitment to authenticity and career readiness also requires that products are made public to relevant audiences. As Kallick and Zmuda describe, we need to expand “students’ opportunity to share information, ideas, and performances with authentic audiences beyond the teacher. Development of task and audience often go hand in hand, and tasks have natural real-world audiences.”[xii] Finally, if we add learning about specific sectors and careers, especially those with the greatest likelihood of future opportunity, to our goals for students, then we might also rethink how we stage tasks, engage partners, assess learning, and encourage student reflection. Leveraging PBL to ensure that students develop the necessary cross-sector competencies takes time and will not happen in a day. It is a process, one that requires a clear and consistent vision against which all key activities, resources, and structures can be strategically aligned. If school and district leaders possess the broader vision of the PBL to develop cross-sector competencies, then they will be able to ensure that a focus on PBL aligns to other curricular work and that the conditions for successful implementation—particularly coherence and culture—are adequately developed. One of the first steps schools might consider in order to develop the conditions for successful implementation is to ensure a shared vision, beginning with a profile of a career-ready graduate. Developing this profile of a career-ready graduate ensures that schools not only have an articulated vision of student success, career readiness, and learning outcomes but also ensures that school and district leaders can communicate the coherence of how the different priorities and initiatives fit together to achieve these outcomes. After articulating a vision for career readiness and communicating what PBL looks like within this vision, schools might consider how their school culture supports the implementation of PBL. In effective PBL, it is not just the planning that looks different. The role of the teacher and the approach to instruction shift dramatically from those of more traditional models. The teacher becomes more of “a facilitator, a coach, a conductor; the guide on the side, not the sage on the stage.”[xiii] Ensuring teacher understanding, buy-in, and support to this vision is a key step, as teachers will drive the implementation of a school’s PBL model. If the teachers are not bought into the vision of the work and how this model can develop cross-sector competencies and lead to increased student outcomes, the school will not achieve the desired implementation or results. Schools must consider how they are building a collaborative culture that values teacher input, that clears the structures and burdens that come with implementing PBL, and that provides the necessary supports. It is helpful to remember that project-based learning efforts will extend beyond the school. In addition to teacher buy-in and leadership, school and district leaders may also want to consider how they build support for PBL with other stakeholders such as students, parents, and community members. These efforts to engage stakeholders contribute both to ensuring coherence of the implementation efforts and also to developing a culture of shared investment and ownership in PBL. America Achieves Educator Networks works with innovative educators and schools to increase the number of students who have access to and complete a quality education pathway that leads to career and life success. This initiative consists of the Educator Voice Fellowship (working to empower educators to be champions of change and ensure that reforms happen with them and not to them) and the Global Learning Network (bringing together leaders from high performing, innovative schools around the world). The following content reflects both the learning and questions that emerged in planning for and participating in the 2017 GLN convening and America Achieves’ ongoing interaction with the schools, expert participants, and our partners in related projects. The intention of this paper is to provide ideas and inspiration for schools and educators, rather than a precise roadmap.